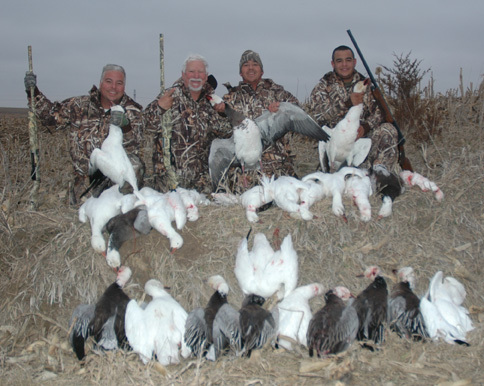 We specialize in hunts in Mound City, Missouri because it is a major staging area for snow geese in the spring as they continue their migration back north. The area is like a funnel in the flyway meaning the biggest numbers of snows migrating come through that area and stage on the refuge. Squaw Creek National Wildlife Refuge. (www.squawcreek.org) which at times will hold up to 2 million snow geese at once. We have seen times when there was somewhere between 2-3 million birds in the area at once. Last season for instance there was probably somewhere in that vicinity of birds in the area. There was a day when birds that migrated north migrated back to the area from the north due to weather and birds from the south migrated north to the refuge. Needless to say we had one field that harvested 168 snows and one field that harvested 72. There were as many birds in the area as I ‘ve seen in the past 7 years of hunting in Mound City. The area is one that we have found through experience will hold the greatest number of birds for the longest period of time. That is why we specialize our hunts in this area. We do however continue to follow the migration north into the Dakotas usually mid to late March. Hunting around the refuge is great however we only hunt fields the birds use, we do not usually hunt just any field just because its by the refuge. We hunt where the birds are is all I can say. Normally we will hunt in a corn field or bean field that had feeding birds in it the previously, other times we will hunt over water set-ups on ponds or small lakes where we catch birds migrating through not stopping at the refuge or birds coming back from feeding that are really thirsty or need to cool down. We also hunt man-made set-ups such as flooded corn fields with pit blinds however we only do that depending on special conditions or circumstances. We have scouts chase the birds every day and find new fields to stay on top of them. You can expect to hunt wherever we have found the birds want to be. We do use some set ups that will stay in the same location that are placed where snow goose traffic is extremely high and decoy the birds as they feed or migrate away from refuges and roosts. However, like I’ve said we want to hunt the fields the birds want to be in as much as possible.